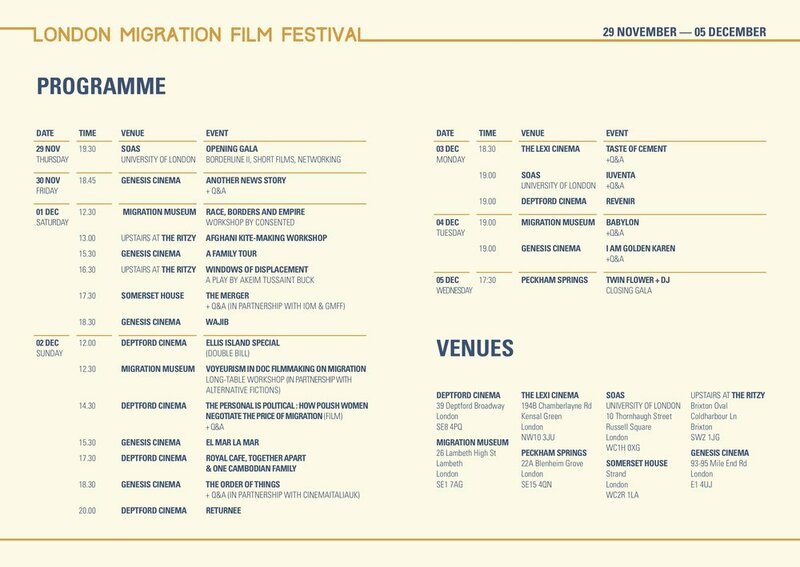 The goal of London Migration Film Festival is to portray the diversity, nuance and subjective experience within migration - including and beyond the refugee experience - in order to restore the dignity and humanity inherent within it. We hope to challenge the rhetoric that overwhelmingly reduces migrants to simplistic categories: active enemies or passive victims. LMFF 2018 took place over the course of a week from 29 November - 5 December. As during its first two editions, LMFF 2018 included a diverse range of activities, such as films, plays, workshops, long-tables, as well as networking opportunities. The detailed programme of LMFF 2018 in can be viewed here. To see the full film list click here. We were hosted in eight venues across London: SOAS, Genesis Cinema, Migration Museum Project, Upstairs at the Ritzy, Deptford Cinema, The Lexi Cinema, Peckham Springs, and Somerset House. We have intentionally chosen films focusing on diverse parts of the world and migratory routes, in order to challenge the expectation that most people move from the Global South to the Global North. Our selection includes both films by established artists and directors, such as Wajib by Annemarie Jacir, as well as films by less known filmmakers who use new perspectives to analyse migration and refugee issues, such as Royal Café by Tenzin Dazel and Returnee by Sabit Kurmanbekov. In order to raise the profile and provide a platform for migrant filmmakers, a number of films within LMFF 2018 were directed, produced and starred in by migrants, such Revenir by Kumut Imesh and Before I forget by Razan Hassan. The films presented in our programme come from a wide range of diverse countries, spanning from Kazakhstan to Mexico, Australia to Hong Kong, Italy to the Czech Republic. This year for the first time we have introduced a special award: “Best Representation of Migrants”, for which a number of shorts presented at LMFF 2018 were shortlisted. The jury for this award is composed by the members of Brighter Futures, a group of active young migrants with roots in a variety of countries and continents working together to bring about change for young migrants in the UK. Brighter Futures is supported by Praxis Community Projects, a charity based in East-London supporting migrants at-risk. LMFF 2018 included activities that go beyond film, such as theatre, workshops, long-tables and family friendly kite-making. To see the programme of LMFF 2018 in detail, please click here. A number of events were accompanied by ‘Migrant Hot Topics’, a podcast series developed by Brighter Futures. Although LMFF 2018 was organised by Migration Collective, it counts on the incredible support of a number of fantastic partners: The Center for Migration and Diaspora Studies at SOAS - University of London, UN Migration Agency - IOM UK, MUBI, CinemaItaliaUK, PSYCHEdelight, The Migration Museum Project, Consented, Alternative Fictions, Dartmouth Films, Archivio delle Memorie Migranti, Praxis Community Projects & Brighter Futures. We partnered with MUBI to offer you a month of great films from around the globe - click here to get started! We would also like to extend a special thanks to this year's film judges: Jules Leaño and Amos Levin. The art piece ‘900’ is by Solara Shiha, an artist and architect based in Berlin, originally from Latakia, Syria. After she obtained a Bachelor Degree and Diploma in Architecture from Tishreen University in Latakia, in late 2013 she moved to Berlin on a Master scholarship from TU Berlin. Since her childhood she was interested in visual arts and developed a sense for details and ornaments. The main theme of her work is the feeling or situation of loss. Loss of loved ones, memories and places. Nevertheless she often uses bright, strong colours and an excessively ornamental style.